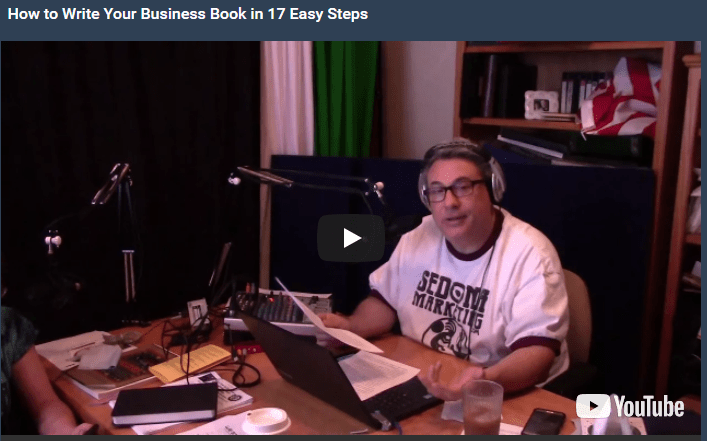 Most of us for our first few books are still a bit intimidated with the entire process of creating our business book. In past blog posts, we have talked about WHY to write your book, so now let’s discuss HOW to get it done. I have broken it down into 17 steps. Put off the title. In the movies, you see the writing of a business book portrayed all the time. The actor has a typewriter, puts paper in it and then… nothing. They are waiting for inspiration. That’s because most people start with the title. Then they think they have to live up to it. Can you imagine naming your book War and Peace? And THEN starting out on Monday morning to write the book? We have gone through 5 titles for the HR Marketing book and are still looking for a permanent subtitle for The Marketing Checklist 3, the social media book. We got through steps one and two pretty fast, congratulations. Some of you are writing your business book while you listen to/read this. Step 3 is creating your Chapter headings. Come up with about 15 to 20 ideas of things you could write about under the topic of your book. Some people use post its on a cork board for this process so that later on, they can move them around easily and see them all at once. Others use a white board. I write them down on paper. By the way, some of these chapters are not going to make the cut, which we will discuss later. Now write 1 or 2 sentences on what is in each chapter. Each chapter should be between 1 and 6 pages. That’s roughly 150 to 2000 words. Another way to put that is 1 to 3 blog posts that you are combining. Acquire an editor. Not your neighbor or your spouse. A real honest to goodness professional editor. Decide on what research you may need to do. Set a calendar for getting that done within a fortnight. You should already know most of this stuff – it is not a Masters dissertation. You might need a few statistics, go get them. Part of this research is going through your blog posts and deciding which ones will be included in your book. We have talked about this: As you write your weekly blog posts, you are writing your book. You may have to edit them from informal to a bit more formal writing style, but that is partially what you have your editor for, to help you with that. Once you have sorted your blogs into the virtual “Yes” and “No” piles, you need to write the rest of the chapters. Give me 22 minutes a day to write. Just before you check email. Each of your chapters are going to take a few days. This means your book is going to take about a month to write. If you have too many chapters or in other words are going too far over 100-150 pages, you may have TWO books. Don’t put it all in one book! The Marketing Checklist – 80 Simple Ways to Master Your Marketing really should have been 49 Simple Ways, to tie in to 49 Stupid Things People do with Business Cards and How to Fix Them. Instead, The Marketing Checklist TWO followed that theme with 49 MORE Simple ways. The Marketing Checklist 3, 4, and 5 are being watched for the amount of content so that they can spill over into other books. Lock the title. And here is a tip which will make it worth your entire reading of this blog: Use keywords someone would type to find your expertise in the title of your business book. Get great cover photos taken. By a professional photographer. You can do this step at any time during this process. Have your book formatted and uploaded to the printer. I am not going to promote any one in particular, there are many. This step is to take care of all the “other stuff.” The acknowledgements. The dedication. Your author bio page. And the copywrite page, which your editor will assist you with. Create the sales page. Or pages. Keeping in mind that since your books are sales tools, why not put sales pages inside them so people can buy more, maybe even in bulk. It could be a coupon for your services. It could be how to get in touch with you to schedule an assessment appointment. Our books are getting more and more salesy. In the business card book, I thought I was being sly by adding a super secret email address that people can have their cards approved. Now, we are adding full on “lights, camera, action” pages of our products. Promote your business book. But that is another blog.